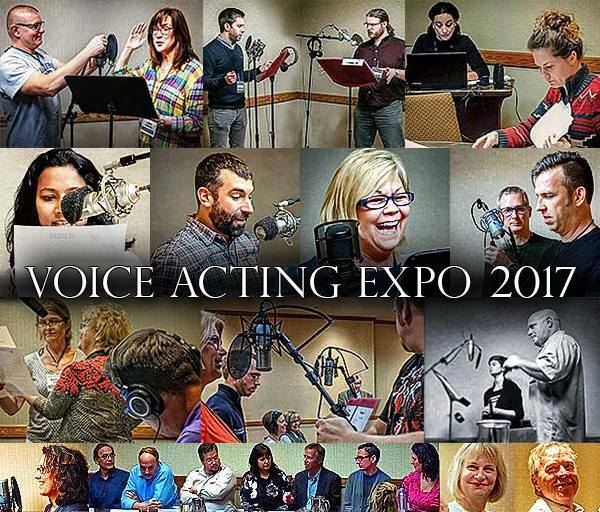 What is the Voice Acting Expo? This is a live, on-mic coaching workshop: you can record five voiceover spots on mic with the guidance of a different coach for each spot. We will have as many as six studios set up, each with a different coach (info) and engineer (info). If you register for an ALL-Access Pass, you are guaranteed 4-5 different coaches. All your audio is recorded on site by one of our audio engineers, emailed to you, and then reviewed with you after the Expo. Our coaches are the cream of the crop in the Twin Cities voice over world—agency owners, top agents, all the original voice acting instructors at them Guthrie, top talent with decades of experience, great directors, and more. This is a top 3 VO market outside outside the coasts, and our coaches have hundreds of years of combined experience in the industry. You get repeated personal attention from 4-5 top coaches thoughout the day. You work in small groups with scripts, exercises and direction are all customized to your specific skills, needs and goals. ►Come Backstage for just $2! DEAL: Passes were $50, now just $5. Apply code 2ONLY when registering. WHAT: Spend over an hour with several top working talent, coaches and agents: ask questions, hear how to succeed, etc. Bring-a-friend encouraged to this backstage Q&A event. WHEN: 5-6:45 PM, and stay for dinner with talent and pros if you wish. Visit our pro coaches page to learn all about the top folks who be coaching or available at this backstage Q&A event. Participating in the backstage Q&A and networking event. What Are The Policies For Registration, Cancellation and Refunds? Visit our policies page for more information. What Different Kinds of Training are Available? Click "Training" in the links at the top of this page to explore your options. Why Should I Explore Voice Acting, Even If I Can Check It Out For Free? It's the most fun you can have while earning a paycheck, and for just a few minutes of work you can earn hundreds or thousands of dollars. And the training is fun too. How Much Money Can I Really Earn? But: While you might be able to quickly recover what you spend on training in earnings, making training a good investment (and did we mention fun?) it's very unlikely you'll be able to earn a living from voice over work in your first year or two.or three. However: People like Jennifer (hear her here), working mostly from home, earn hundreds of thousands a year. But don't kid yourself: There's have-some-fun-on-the side thousands, and there's work-your-tail-off-it's-a-business millions. Don't expect millions tomorrow. Make it fun, put in some time, and the money will follow. For example, as an experiment, she worked with two services to do extra auditions to try to get even more work. She earned $17,660 of her $850,000 in 1999 on those 701 auditions-just about her lowest paid work. If a voiceover multi-millionaire will do approximately 60 auditions/month for her lowest paid work, what will you do? Formula: lotsa bucks=lotsa work. Don't I Need A Special Voice, Or To Be A Celebrity? No. Listen again to Jennifer's voiceover here. She's not any kind of celebrity, and she's not using some dramatic special voice sound to get work. Much of the work is for transparent (doesn't draw attention to itself) and guy/gal next door kinds of voices. And I don't just mean commercial work. Narrative work (for example, being the voice on a training video) has a huge demand for transparent-type voice talent. Two abilities we see consistently in top talent are that they know how get out of their own way and inject some fun into their work. Making it fun is relaxing, and makes everything work better. Yup: you're required to have fun. Bummer, huh? Don't I Need To Be In LA Or New York And Join A Union? If you didn't live in the Twin Cities, you should move here if you wanted to get started in voiceover. Why? Because the Twin Cities is the largest non-union voice over market in the world. Here, non-union talent earns rates similar to union talent. In fact, many union talent even do NON-union work in the Twin Cities, because there is so much non-union work, and because it pays so well. Voiceover training from School of Voiceover has been approved for Job Training funding from the State of Minnesota. Several students have had their training paid for by the state. Since the State is of course a massive bureaucracy, and we don't work there, we can't promise they will pay for yours, but why not check it out? Contact Sarah and she can tell you more. Elsewhere it's over $1,000 for all this. Why do these trainings cost less? So called "package deals" force you to pay for everything up front, usually with just one coach. But you can get more hours of individual training with more coaches for less money through small group classes such as offered by School of Voiceover during the 2017 Expo. Because our workshops bring 5 coaches to you, it's literally more for less, and it's more personalized, since you can decide exactly what kinds of training you need most, and can fit learning into your schedule without having to pay for everything up front. Plus, you get to work with our dozen+ great coaches. While we have had people get their first paying work (see our jobs posting) while taking their first training class, how about starting today instead? How? School of Voiceover has a referral program. They're already paying some people hundreds of dollars. "One of the few things in life that's not only fun but that pays you is voice acting, and there's some free trainings at the Voice Acting expo this Fall. Check it out here, and email my friend Sarah at Sarah@VoiceResults.com." School of Voiceover is also doing a conference call to help answer questions for people who want to promote them. They can provide you materials, business cards, etc. if you want to put some work into it. Contact Sarah for more info. What If I Have A Job, Or Alternatively, I'm Unemployed? Voice acting can work in addition to a job for extra money, as income when unemployed, or as a home business. Most work falls into two kinds of schedules: Show up at a location during working hours in the next couple of days for a session or audition, or respond to postings looking for talent quickly after they are posted from your home studio. Most folks with jobs are able to adjust their breaks during the work week to accept voiceover auditions and sessions, and respond to some online postings quickly. But being unemployed can make it easier for you to respond quickly to some kinds of opportunities. Got a computer? You can get everything else you need for under $300. Computer technology has advanced, and things are downright cheap nowadays. We're living in the future, people! Skills? If you can operate a boom box, you can record yourself. Don't worry: we'll teach you the really, really easy way. It's much simpler than you think. I would say it's about as complicated, computer-wise, as helping a couple of friends sign up for Facebook. The good news is that voiceover is lots of fun. You get to play, pretend and get paid for it! And while you don't need a special voice, you do need to be able to take direction. If you haven't already, listen to Jennifer’s voiceover here. Remember, she made $850,000 that year! Many of the best commercials sound real and believable: much of the work is for transparent (doesn’t draw attention to itself) and guy/gal next door kinds of voices. Wonderful voices that can't do more than just read the words, rather than tell a story, don't get much of the high-paying work. But they can learn. Yes, voiceover is a fun hobby that you can get paid for! But you need to enjoy it AND stick with it. That means acting is critical, but it's very entrepreneurial to earn a good living. What we've learned from teaching and talking to hundreds of students is that everyone has a key issue they need to work on. And those that say "That's the issue I most need to practice" do well. Those that say "that's why I'm no good" do poorly. It starts with practicing clear speech and reading ability. Then you need to understand acting, timing, script analysis, and, believe it or not, body language. The goal is to make someone else's words sound like your own, like you're having a natural conversation yet be interesting and compelling- a believable character telling a story. You need to be able to read from a poorly-written script verbatim and sound natural. People are excited to learn that they can be paid thousands of dollars for their work in a studio, but few people seem to make the connection that the work on their demo needs to be the same quality as the work they will get paid for. While you don't need to spend thousands of dollars, you do need to spend a couple of hours with an engineer and coach who knows your talent and the marketplace you are seeking work in to make a good demo. Demos need to follow the standards of the marketplace you will be seeking work in, have appropriate music, showcase the things you do most likely to get you work in a particular marketplace, and compare favorably to the demos of talent similar to yourself. You need professional advice to make a great demo that meets all these requirments. While demos can cost up to $1,500 in the Twin Cities, School of Voiceover has arrangements with studios and engineers that bring that cost as low as $450 for most demos. What is School of Voiceover? Sarah Jones-Larson is a 28-year voiceover professional. She started School of Voiceover in the Twin Cities over a decade ago, and began teaching voice acting at the Academy for Film and Television (now Caryn's Academy). Her students have gone on to do national work, and she now hires top talent, agents and coaches to provide you the best training out there at the lowest cost. Her voice has been heard on hundreds of radio and television commercials locally and nationwide and in hundreds of training, medical, and technical DVD’s, IVR, and on the web.